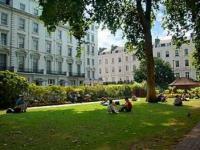 Comfortable 3 star hotels and 4 star hotels which are near the most popular tourist attractions in London. Fortnum and Mason, Hamleys, Harrods, Harvey Nichols & Liberty. Just 200 metres from Wandsworth Town Rail Station, this modern hotel is only 2 miles from Earl's Court. Holiday Inn Express offers free breakfasts, a 24-hour front desk and rooms with air conditioning. 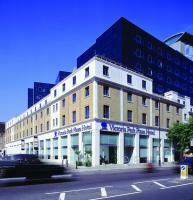 The Park Plaza Victoria London occupies a convenient location, positioned around the corner from Victoria Station in London, England. This hotel provides close proximity to many of London's principle shopping and sightseeing venues. Hotel Features. The Park Plaza Victoria London features a spacious lobby decorated with recessed neon lights and contemporary artworks. Just 15 minutes' walk from Camden Town Underground Station, New Market House features a traditional restaurant and lively bar. With free Wi-Fi, the hotel is situated in vibrant Camden. The modern bedrooms each have a flat-screen TV and a DVD player. The 5-star Bentley Hotel is situated in Kensington & Chelsea, close to exclusive shops on Kings Road and a mile from Harrods. It offers an on-site gym and an elegant cocktail lounge. 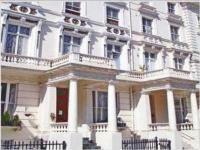 Located in an historic Georgian building, The Inverness Apartments are 200 metres from Hyde Park. These modern apartments offer fully equipped kitchens and lounges with comfortable seating and flat-screen TVs. The former home of the Duchess of Kendal, the Millennium Hotel London Mayfair stands in the exclusive Mayfair district of London, England. Bond Street is located 200 metres away, while the Marble Arch entrance to Hyde Park is positioned 400 metres from the hotel. Hotel Features. The hotel's historic façade faces Grosvenor Square, although the main entrance is located behind the hotel. Just 500 metres from Tower Bridge, Premier Inn London City (Tower Hill) is a 5-minute walk from the Tower of London. The hotel has family-friendly rooms, a restaurant and coffee shop. The Norfolk Plaza Hotel is an elegant building set in a tranquil garden square. It is just 2 minutes' walk from Paddington Train Station and the Heathrow Express 15-minute service. The shops of Oxford Street can be reached in around 25 minutes'. The Avon Hotel is located in London's West End, just 200 meters from Paddington Train and Tube Station. Set in an historically listed Victorian building, the hotel offers affordable rooms with free Wi-Fi and provides cooked English breakfasts. Club Quarters, Gracechurch is located across from the popular Leadenhall Market in London, England. The River Thames flows four blocks from the hotel, while the West End theatre district is located less than two kilometres away. Hotel Features. This hotel, constructed above a 2,000 year old Roman basilica, features an Edwardian style lobby with high ceilings, leather chairs, and marble clad walls hung with commemorative artwork.